Ginger has plenty of other beneficial properties besides its taste. Chinese medicine and Indian Ayurvedic medicine have used ginger to help treat and prevent health problems for thousands of years. In the west, we are just learning how valuable it is. 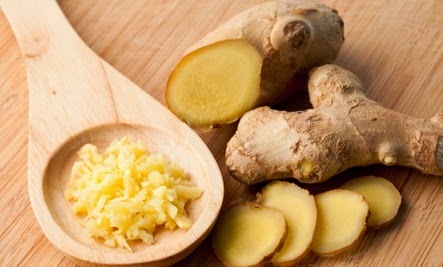 Some studies in humans have shown that ginger reduces nausea in morning sickness. Also studies at the University of Maryland show that ginger reduces motion sickness, but others have shown mixed results. Ginger is known to be helpful in relaxing blood vessels in the head. One study found ginger powder was as effective as Sumatriptan medication in decreasing migraines. Chinese herbalists for thousands of years have used ginger as an antihistamine and decongestant which are two main effects of a cold. The University of Maryland Medical Center says ginger is helpful in treating cold and flu symptoms. In a study it was found that ginger extract may be effective for the control of diabetes and be protective for diabetic kidney disease. A study published in the National Library of Medicine compared ginger extract to common pain killers and found ginger to be very effective in reducing pain. ”Many studies in cell culture have shown that ginger is an anti-inflammatory,” says researcher Suzanna M. Zick, ND, University of Michigan Medical School, Ann Arbor. Scientists put a solution of ginger powder and water on ovarian cancer cells. The cancer cells died from the contact with the ginger solution (the cells committed suicide or they digested themselves). While the study showed promising results, more research is definitely needed. In one study, researchers found that colon cancer cells were suppressed. The University of Minnesota found that ginger may slow the growth of colorectal cancer cells. More research is needed. “Ginger has anti-inflammatory, anti-ulcer and antioxidant activities, as well as a small amount of analgesic property,” says Roberta Lee, MD, vice chair, Department of Integrative Medicine, Beth Israel Medical Center, New York City. Add ginger to your diet along with foods such as beets, onions, and flax seed oil to reduce inflammation.